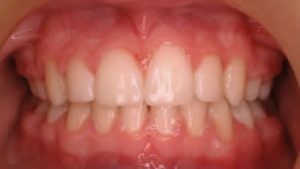 This patient had severely crowded upper canine teeth before treatment. The lower teeth have also shifted to the left side. This photograph shows the teeth immediately following removal of the fixed brace. 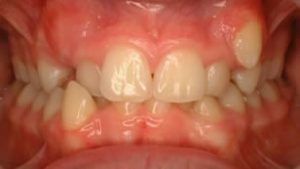 The treatment in this case involved upper and lower fixed braces over 20 months with premolar teeth extracted to provide space to align the teeth. 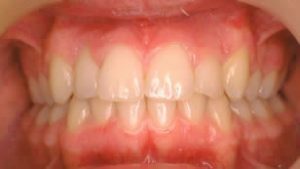 This patient has severely crowded upper and lower teeth and is very unhappy with the appearance of his smile. 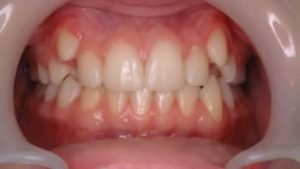 This photograph shows the smile after 18 months of fixed brace treatment with premolar teeth extracted to make space available.